The Sacramental Life of St. Sebastian's School is a crucial element in a student's experience of faith and religion. 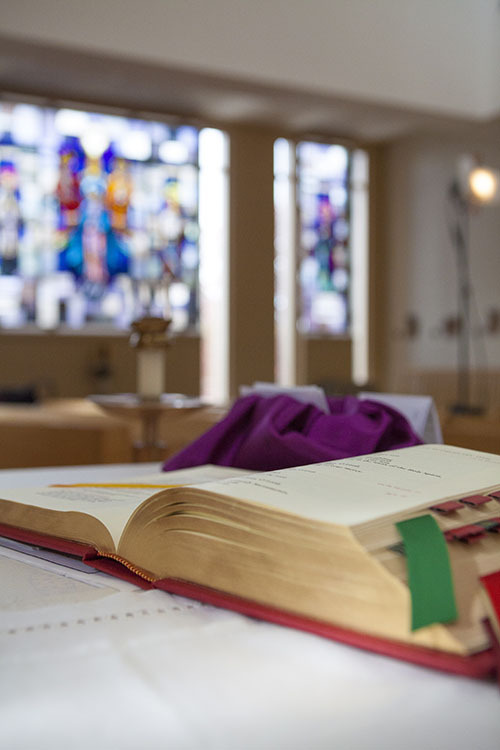 Mass is offered each day at 7:15 am in the Chapel, for those who wish to attend. The entire St. Sebastian’s community gathers in the Church for a required Mass at least once a month, usually on the First Friday of the month. Students are engaged in the liturgy as altar servers (some even serve the daily Mass) and lectors, and student singers and musicians provide the music. Reconciliation is offered through Religion classes twice a year by Fr. John Arens, the School Chaplain. Each student has the option of actually going to confession, or of using the time in the Chapel with his classmates to pray and reflect quietly. In addition to our daily and school-wide liturgies, we offer many opportunities for our community to celebrate the Eucharist, including annual Latin Mass, the Mother-Son Mass & Supper, Father-Son Mass & Supper and special Masses for varsity sports teams.